This press release about Accessible Pedestrian Signals (APS) was issued as a result of a Settlement Agreement negotiated by Lainey and co-counsel Linda Dardarian using Structured Negotiations. Claimants in the San Francisco APS case were the California Council of the Blind, the San Francisco based LightHouse for the Blind and Visually Impaired, the Independent Living Resource Center San Francisco, and blind advocate Damien Pickering. The full Settlement Agreement is posted in the Accessible Pedestrian Signals Settlements Category. San Francisco, California (June 20, 2007) — San Francisco Municipal Transportation Agency (SFMTA) Executive Director and CEO Nathaniel P. Ford, Sr. and City Attorney Dennis Herrera today announced a comprehensive agreement with representatives for the blind and visually impaired community, in which the City will commit at least $1.6 million over the next two and a half years to install accessible pedestrian signals. The state-of-the art signaling devices will assist visually impaired pedestrians by emitting a rapid ticking sound in tandem with the familiar WALK symbol displayed for sighted pedestrians. Other accessibility features include locator tones and vibrating pushbuttons to help those with visual impairments locate the devices, and the ability to provide helpful audible information such as street names when pedestrians press the pushbutton for one second or longer. The agreement which was reached without litigation through a collaborative process known as structured negotiations represents the first of its kind in the nation, according to advocates for the blind and visually impaired community. 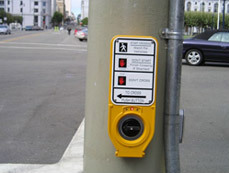 In addition to the $1.6 million committed to install accessible pedestrian signals at no fewer than 80 intersections over the next two and a half years, the agreement provides that the City will seek additional funding for more installations and develop a policy for San Francisco residents to request accessible pedestrian signals at other intersections. The agreement to install accessible pedestrian signals puts San Francisco in the national vanguard in working to enhance public safety for blind and visually impaired pedestrians. The SFMTA is committed to do everything it can to expand this program to its fullest potential in the years to come, said SFMTA Executive Director and CEO Nathaniel Ford. I am very grateful to the advocates for San Francisco’s blind community in working to advance this comprehensive agreement, especially Anita Aaron of LightHouse for the Blind and Visually Impaired, and Eugene Lozano, Jr. and many members of the California Council of the Blind.. I also appreciate the hard work of City Attorney Dennis Herrera and his deputies, whose commitment to finding a mutually beneficial solution made this agreement possible. This agreement reflects far more than our commitment to public safety it represents San Francisco’s commitment to engage the disability community in a manner that is cooperative rather than confrontational on matters involving accessibility and compliance with the Americans With Disabilities Act, said City Attorney Dennis Herrera. Im very proud to have reached an accord that is the first of its kind in the nation, committing to install state of the art signaling devices while averting the possibility of costly litigation. I’m grateful to Nat Ford for his leadership and vision on this issue, and thankful, too, for the positive approach taken by advocates for the blind and visually impaired community. Representatives of San Francisco’s blind community applauded todays’ announcement. In addition to the City, parties to the agreement are the California Council of the Blind, the LightHouse for the Blind and Visually Impaired, the Independent Living Resource Center San Francisco, and Damien Pickering, a blind individual. In the negotiations, the blind and visually impaired community was represented by disability rights lawyers Lainey Feingold and Linda M. Dardarian. Representatives of the LightHouse for the Blind and the California Council of the Blind available for interviews and demonstration of APS technology. This document is the press release about the Settlement Agreement with San Francisco about Accessible Pedestrian Signals. These signals, also called APS, make a sound when the walk sign is on. The signals also vibrate when the walk sign is on. This agreement was the first of its kind in the United States. The City agreed to spend at least 1.6 million dollars and install APS. At least 80 intersections will have APS. No lawsuit was filed. Instead, Structured Negotiations were used. Lainey Feingold and Linda Dardarian were the lawyers. The California Council of the Blind, the San Francisco based LightHouse for the Blind and Visually Impaired, the Independent Living Resource Center San Francisco, and blind advocate Damien Pickering helped to negotiate the Agreement. One part of the agreement are detailed requirements about APS. There is also a detailed document to help other cities decide where to put APS.